When it's a matter of deserving living high modernist composers, Gyorgy Kurtag (b. 1926) belongs up there though he does not always get his due. Enough of his music, happily, has seen the light of day in the recorded medium that we can gauge his merits regardless. Today's selection is a good example. His Complete String Quartets (ATMA Classique ACD2 2705) comes to us in a major new recording by Quatuor Molinari. His quartet work is sufficiently terse and concentrated that the entire output fits on a single disk, covering the period from 1959 through 2009. Like Webern, Kurtag does not provide a single superfluous note. His complex and highly colored string language is as dense and purposeful as it is memorable and alive. Quatuor Molinari presents the works in chronological order and puts in all the precision and expressivity the works demand. You can hear a progressive movement beyond serialism to something more intensely personal. The "Quartet No. 1, Op. 1" (1959) was a breakthrough from a frustrating period of blockage. He transcended it by working with only two or three notes at a time. There results a music of great intensity. The "Hommage a Andreas Milhaly, Twelve Microludes, Op. 13" (1977-78), uses quotations and an even more terse approach to create the twelve miniatures. "Officium breve in memorium Andreae Szervansky, op. 28" gives us a radical brevity of 15 movements in three minutes. The "Aus der Ferne III" (1991) and V (1999) are from a series of tributes to the music publisher Alfred Schlee, who among other things heroically kept numerous modern music scores out of the hands of the Nazis (and sure destruction) in WWII. They show an increasing freedom of language, notably cello pedal tones and "literal" depictive expressions. "Hommage a Jacob Obrecht" (2004-05) pays tribute to composer Jacob Bali and his fondness for Renaissance polyphony with a deft conflation of early music with the modern. "Six Moments Musicaux, Op. 44" (2005) is a major mature work via six brief but impactful expressions. Finally "Arioso" (2009) pays tribute to Walter Levin and the LaSalle Quartet, who staunchly advocated new music composers for more then 40 years. The music is "in the manner of Alban Berg." And that concludes the program. 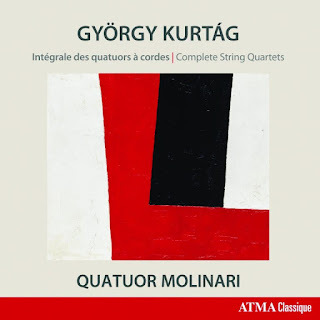 By concentrating on just the Quartets and presenting them chronologically Quatuor Molinari gives us pinpoint insights into the development of Kurtag's music from a terse rigor to a profoundly free but no less terse expressivity. These are beautiful performances of significant works. The release is a must for high modernists. And a fitting last post for 2016. Onward! 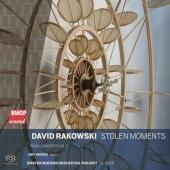 Stolen Moments (BMOP Sound 1048) gives us two recent works of a modern and rhythmically very lively cast by David Rakowski (b. 1958), a pupil of Milton Babbitt who has gone on to develop a very abstracted yet melodically-harmonically communicative style, not Serialist per se so much as post-Serialist and eclectically beyond category. The title work (2008/2010) is almost a concerto for piano and orchestra but in the end gives the orchestra as much or more of a say in the musical pathways that fit together so intricately well. The idea was to take elements of modern jazz and reframe them in new music terms. Pianist Sarah Bob does a fine job with her complex piano part. The Boston Modern Orchestra Project under Gil Rose handles its part with its usual impeccable sense of form and detail. The same could certainly be said of the "Piano Concerto No. 2" (2011) and its even more complex and demanding modernist sprawl of jagged abstractions and beautifully communicative down-to-earth contrasting phraseology. Amy Briggs tackles her part heroically well, providing the essential high energy level so important to this work's successful performance. We come out of this program with a rabid appreciation of David Rakowski as a high modernist who can and does incorporate some so-called vernacular elements for two brilliant cocktails of flavor and color. It is yet another ravishing release in the BMOP series. Very much recommended. 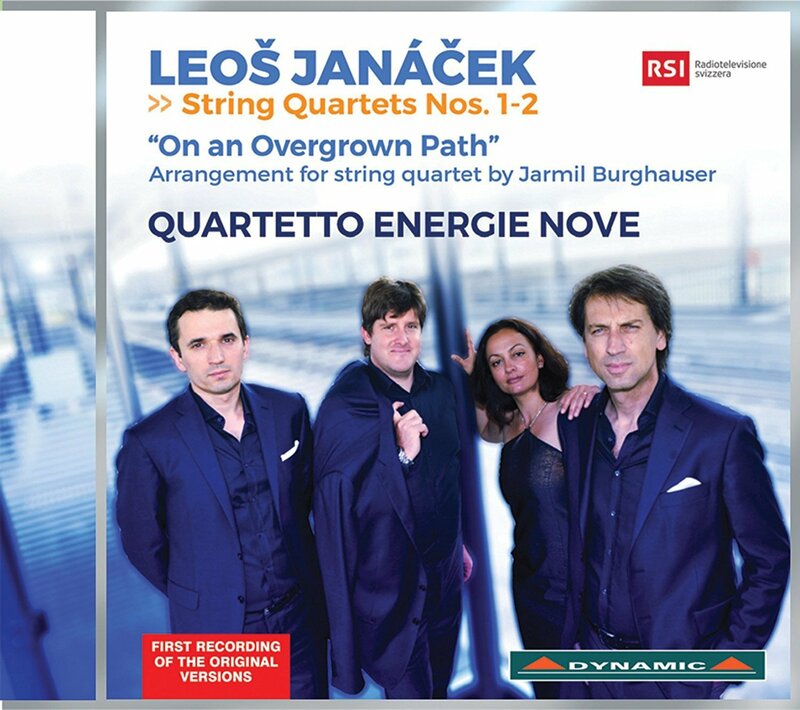 I regard Leos Janacek's String Quartets Nos. 1-2 (RSI 7708) as old friends. My first exposure to these tabula rasa gems was on an old Czech LP and until forced relocation last July and the loss of most of my LPs it admirably took its place in the listening rotation. The new World Premiere recording of the Barenreiter Critical Edition by the Quartetto Energie Nove has been filling my ears for several weeks and though I first preferred that old Czech version I am getting quite fond of this new one. Included as a bonus is Jarmil Burhauser's arrangement for string quartet of the solo piano opus "On An Overgrown Path" (Book One) and I must say it gives the Janacek (1854-1928) lover something "new" for quartet. If you didn't already know the piece you would not suspect it was not originally meant for the quartet. All sounds right in Burhauser's arrangement. The String Quartets are primo Janacek, giving us a good deal of that uncanny combination of modernism, Eastern European folk strains, and an enormous memorability as only Janacek and his thematic brilliance can pull off. Quartetto Energie Nove excels in a sort of folk brio, an almost Gypsy-like interpretation of the music at key points. 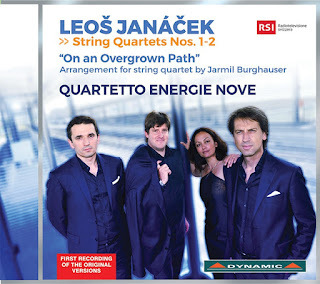 They bring out that element remarkably well and though perhaps my old LP sometimes brought the sheer beauty of some passages out more so than Quartetto Energie Nove, after a few hearings it is the latter's approach that in the end sounds right to me. This is a performance that will be hard to top. The addition of "On An Overgrown Path" makes the release all that much more appealing. There are no quartets quite like this and Quartetto Energie Nove give us beautiful readings of the new Critical Edition. Don't hesitate! Today's offering is a fascinating mix of Works for Piano and Orchestra (Grand Piano GP 678) by three modern Russian composers, Galina Ustvolskaya (1919-2006), Valentine Silvestrov (b. 1937) and Giya Kancheli (b. 1935). 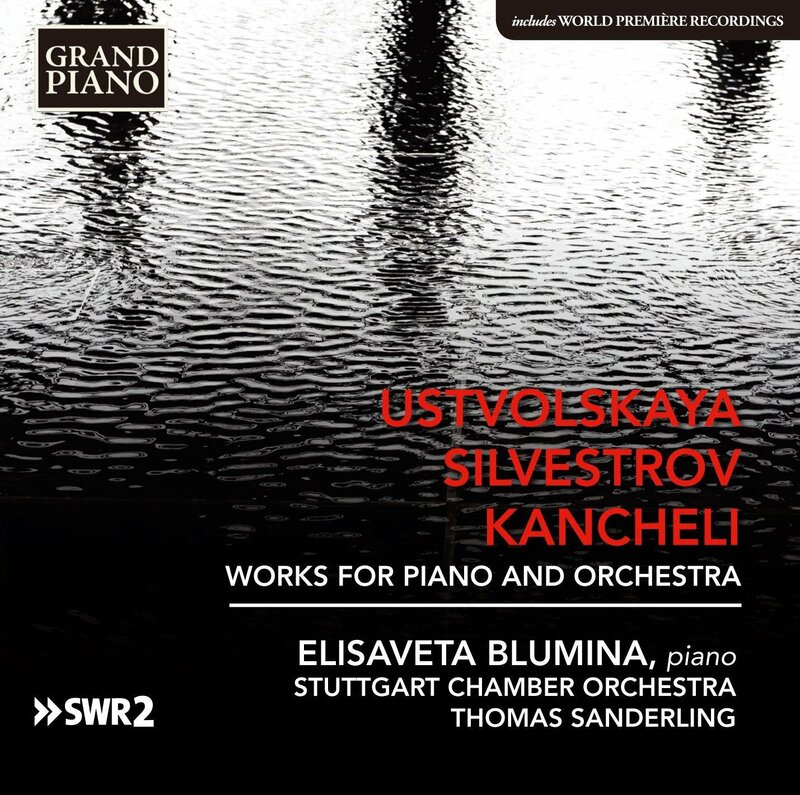 Elisaveta Blumina does the honors with the various piano solo parts; Thomas Sanderling leads the Stuttgart Chamber Orchestra. Altogether they make a convincing case for the four works represented here. Perhaps the most astonishing of all of them is Ustvolskaya's "Concerto for Piano, String Orchestra and Timpani," written in 1946 in her last year at the Leningrad Conservatory. It is a highly dramatic, highly engaging work not nearly as brash and dissonant as her later piano works were to be, but stunning in its beautiful severity. Regular readers may recall that I reviewed another version of this work, by pianist Patricia Hast and Ensemble Galina/Peter Leopold this past October 17 on these pages. That recording also included a rare chamber orchestra version of Beethoven's "Piano Concerto No. 2." The Hast Ustvolskaya may have a slight edge over the Blumina here, but of course the present disk is an all Russian, all modern affair so I would say both are indispensable. Moving along then we have Silvestrov's "Four Postludes" (2004) next up on the current program. It is a first recording of some mostly very quiet, enchanting postmodern fare. Though it is not specifically named as a nocturnal, it surely has that sort of uncanny atmosphere. 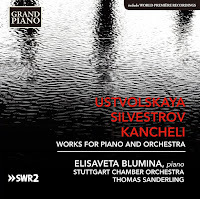 The Kancheli work, "Sio for String Orchestra, Piano and Percussion" (1998), also a First Recording, gives us a kind of folk hymn as the principal theme. Quietude is interrupted with outbursts of contrasting diatonics and somewhat more strident modern flourishes. The tender and the almost brutal alternate with quite vividly depictive tone color painting. It is imaginative and expressive in an original way, somehow very Russian at that. Finally we get the short concluding "Hymn 2001" by Silvestrov. This is unabashed lyricism with a pronounced romantic bent, nearly Mahleresque, yet with profound modern touches. So that is the size of this very worthwhile, contentful release. Both Blumina and Sanderling/Stuttgart Chamber Orchestra put a good deal of care and commitment into the realizations. The results are quite exemplary. Bravo! The art of imitative counterpoint in the right hands is labyrinthine and multi-refracted, a kind of minimalism that never quite repeats in its fullness and ever-overlapping movement, yet is build upon shifting repetitive blocks of sound. A master of the classic form of imitative counterpoint is one Pierre de Manchicourt (c.1510-1564), who thrived as a principal composer of the Franco-Flemish School of the second third of the 16th century. Perhaps because his style of composing was considered old fashioned in his last years (cf. Bach) his music has largely languished in obscurity until today. 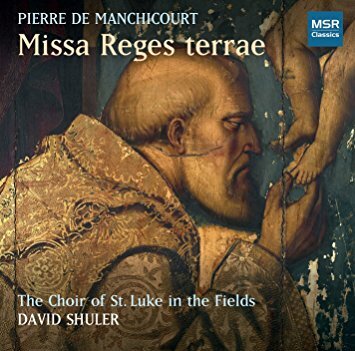 Missa Reges terrae (MSR Classics 1632), a full disk of his choral works nicely performed by the Choir of St. Luke in the Fields under David Shuler, gives us a vivid snapshot of the brilliant interlocking style of Manchicourt which includes the World Premiere of the title piece as well as a number of equally appealing shorter works. The performances are bracing, pinpont realizations of the music, hauntingly beautiful and glowingly soundstaged. If we are at last able to hear Pierre de Manchicourt with open ears, it is because the times are right for his music at last. It has emerged from the archival darkness of 500 years to assume its rightful place in our musical pantheon. 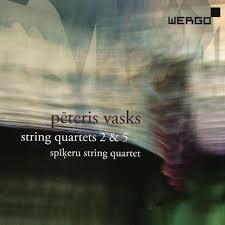 Peteris Vasks (b, 1946) a Latvian (Russian Soviet) composer of stature creates music he hopes will console and inspire the downtrodden--the ill, the poor, the harassed and harried among us. In that he does with music what perhaps his Baptist minister father did with words. The liner notes quote the composer at some length and give us a clear vision of the man. That rings true of the music on this, the Spikeru String Quartet's recording of his String Quartets 2 & 5 (Wergo 7329 2). The music is mostly tonal, but also aleatoric and ultra-modern in brief passages that depict chaos and evil, beautifully folk-like and lyrical all at once. The Quartet No. 5 begins with complex multi-stops and a dramatic folk-hymn feeling. It blossoms forth into a spectacular sonic harmonic world, then almost Beethovenesque in its dramatic, nearly breathtaking unfolding. The second movement begins in hushed sadness, fragile, lyric, and stays there for the whole. There is a healing quality here, yes. Quartet No. 2 is a moving quasi-pastoral work subtitled "Summer Tunes." There is a seriously moving movement representing the coming into bloom, a gentle movement of bird song (first as if heard from a distance, then nearer) and a final elegaic conclusion of sadness and hope. These beautiful works make one want to hear the other quartets at once, thanks to the Spikeru's loving attention to every detail of the music and the sheer persuasiveness of the works themselves. Several weeks ago we explored the choral music of Charles Villiers Stanford (1852-1924). Today we light upon the chamber element of the nearly forgotten composer, with three sonatas for viola and piano by Stanford and two of his illustrious pupils. The Stanford Legacy (Nimbus Alliance 6334) showcases Martin Outram and Julian Rolton on viola and piano, respectively, and their strong, earthy interpretive acumen on display for the three substantial compositions that make up the program. These Late Romantic-Early Modern sonatas are powerfully charged with depth of feeling but not of sentiment. Each has complex thematic virtuoso unfoldings that sound fresh, never cliched. This is music not designed as superficial salon baubles, but rather as earnestly serious fare for connoisseurs. Stanford's influence as a teacher of composition was an important part of his legacy. He taught Bridge, Holst, Bliss, Vaughan Williams and, especially relevant for this album, Rebecca Clarke and John Ireland. 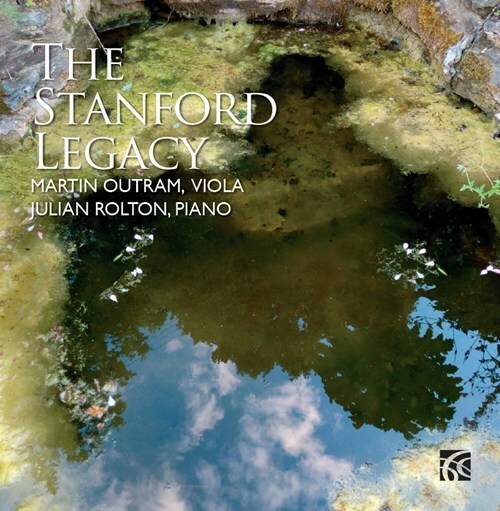 The Stanford sonata represented here was originally written for clarinet and piano in 1903 and was arranged for the viola as solo instrument by Henry Waldo Warner with the composer's approval in 1914. It shows obliquely Stanford's indebtedness to Brahms but with its own inventive thematic developmental path. The Rebecca Clarke sonata gives us a rewarding view of the budding confidence of the composer and violist in 1919, who wrote over 100 works before marriage in 1944 put an end to it. There are whimsical passages, a rhapsodic depth and a hint of modernism in her chromaticism and sometimes harmonically advanced vocabulary. John Ireland's First Violin Sonata of 1908 (revised in 1917 and again in 1944) in its re-arrangement for viola by Outram concludes the program with adventuresome fare that though often rhapsodic like the others has a strong pull towards post-romanticism while retaining a very lyric stance. Outram and Rolton go a long ways to give us an expressively deep reading of these three sonatas. In the end we return to these works with real pleasure. I imagine all modern era Anglophiles will be drawn positively to this album. Yet it will please anyone looking for late romantic chamber music of stature. 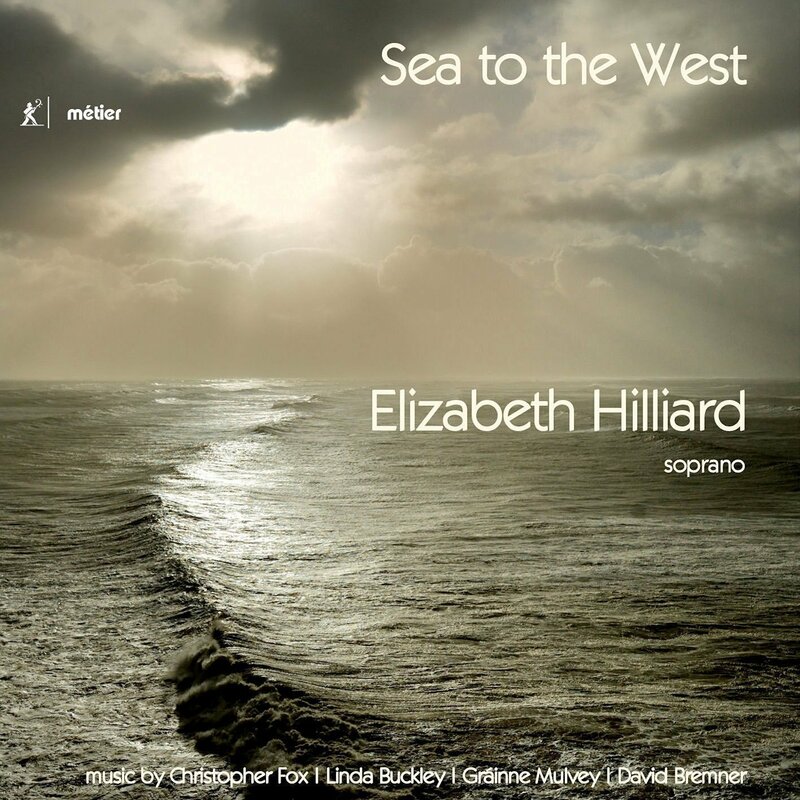 Dublin's Soprano Elizabeth Hilliard has a wonderfully full voice, a great range and the musical imagination to bring life to contemporary ambient soundscapes. 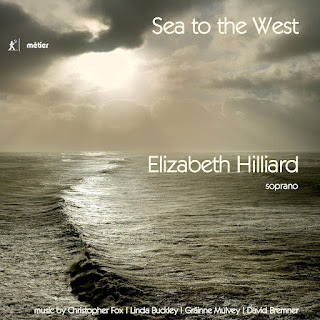 Her recent album Sea to the West (Metier 28551) shows this admirably well, in a program of six works for solo voice plus occasional multitracking and electroacoustic enhancement. New works mostly from this century provide thoughtful ear fare, with two works apiece by Christopher Fox ("Sea to the West"  and "Magnification" [1978-80] and Grainne Mulvey ("Phonology Garden"  and "Eternity is Now" ) plus single opuses by Linda Buckley ("Numarimur" ), and David Bremner ("logic ballad #2: The guarded tourist makes the guide the test" ). The only given is Elizabeth's flexibly alive voice and a sense of open presence. Every work is evocative of association of place or earth, presence and poetic memory, all taken in its widest sense. Time seems to stand still in the suspended vocal world unveiled. This is introspective music that puts the listener in a ravishing but ultimately spare and rarified zone. The composers and Elizabeth's wonderful voice make it all work. This is not contemporary fireworks to awe the soul so much as an intimate hour or so with poetic depth. To the thinkers and musically sensitive beings out there, this is a captivating change of pace. Nietschke's division of art into the Apollonian, or the even-keeled, the stately and perhaps, reserved, and the Dionysian, the ecstatic, orgiastic, the exuberantly unleashed, can be illuminating when applied to music. John Cage's prepared piano music might be seen fruitfully as the former, unwinding at a steady and understated pace. 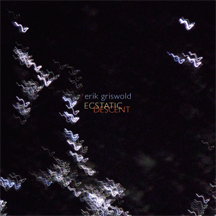 Erik Griswold's prepared piano opus Ecstatic Descent (Cold Blue Music CB0047), on the other hand, is firmly in the Dionysian camp, a beautiful torrent of exotic timbred notes. For those new to all this the prepared piano was essentially invented by Cage by inserting metal, rubber and other sonically altering objects on or between the strings to give the piano a radically transformed sound more like a percussion orchestra than not. His series of prepared piano works from the late '30s on were breakthrough works that first definitively identified him as an important American composer. Through the years others took on this configuration in various ways. Erik Griswold gives us his very own take--with a rousingly manic, key-centered adventure fascinating to hear. Halfway through there are brief pauses now and again that re-situate the tumult and give it definition. The 45-minute work has so rich a cornucopia of sound colors that it never ceases to fascinate. There is not a minute too much. All lays out fittingly, with a fresh ambiance that neither relaxes nor wearies the close listener. Kudos! This is a blast. 19th and 20th Century Spanish Nationalist classical music, when done well, liberates the tonality from its pan-European shackles to give us music both folkloric and for its time, modern. That is certainly true of the music of Enrique Granados (1867-1916), a relatively early but very accomplished exponent. 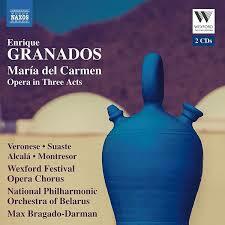 We can hear this readily and consistently in his opera Maria del Carmen (Naxos 8.660144-45 2-CDs) as performed in the Wexford Festival Opera Production of 2003. It was written fairly early in his career, premiered in 1898 and after mixed reviews and a number of performances was not revived again until 1935. Part of that had to do with the Catalan contingent, who did not feel it was Catalan enough (the action takes place in rural Murcia). Yet Granados rightfully considered it an unqualified success aesthetically. It was his first stage work and it speaks to us today directly through its lyric dramaticism and beautiful adaptation of traditional sounding rustic Spanish melodic-harmonic strains. The present recording is very solid and convincing in the hands of Max Bragado-Darman, a host of soloists, the Wexford Festival Opera Chorus and the National Philharmonic Orchestra of Belarus. Diana Venonese, in the principal role, takes some getting used to for her vibrato-heavy explosiveness, but one finds oneself adjusting in time. The production as a whole is first-rate and gives us a vibrant reading of the extraordinarily fetching work. Anyone taken by Granados in particular and Spanish Nationalism in general will I believe readily respond to the work. Admirably well constructed, movingly lyric and emotionally direct, in is vintage Granados at his best. John Tavener (1944-2013) is one of the most striking choral composers of our time. Like Arvo Part, he exemplifies an old-in-the-new transformation of early music influences to make something different--modern and very personal. In Taverner's case plainchant and especially Russian Orthodox chant are important models from which he freely and creatively draws. We can hear some beautiful sacred choral music along these lines on the album Missa Wellensis (Signum Classics 442) featuring the Wells Cathedral Choir under Matthew Owens. Four of the works, including the title piece, enjoy world premiere recordings. All eleven mostly short works are given definitive, angelic treatment by the choir. 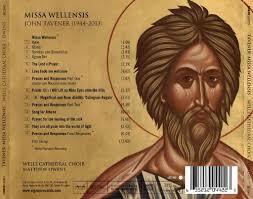 The homophonic influences of Orthodox chant and Organum are apparent throughout. As with much of Taverner's choral music the archaic and the contemporary form the basis for his sensitive brilliance. These are the late works (2010-13), written after a debilitating heart attack (2009) forced him into convalescence and ultimately a determination to boil down the music into a sacred essence. As the liners note, these last works proffer an austere music, indeed, but there is warmth and a penetrating sonic depth to it all in the end. The "Missa Wellensis" and the "Preces and Responses" were specially commissioned for the Wells Cathedral and so have a pedigree that the choir readily makes present in their performances. But all of these works get detailed attention and sonic care. Anyone seeking modern choral music with ancient roots, anyone interested in Taverner's last works or who do not know his music as a whole would do well to get this volume. It is in every way a celebration of the beauty and direct celestial inspiration of his final musical vision. The coldest "feeling" day of the year here raises questions about reality that the weatherman glibly ignores. It "feels" like x (wind-chill factor), yet it isn't. 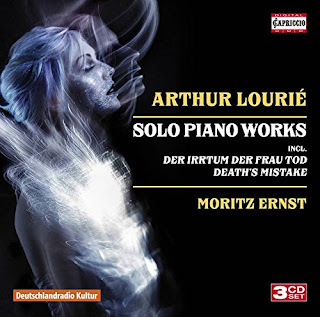 Similarly to say that the Solo Piano Works (Capriccio 3-CD C5281) by Arthur Lourie (1891-1966) "feel" somewhat akin to a post-romantic melange of late Scriabin, something of classic Debussy, proto-Messiaen and on the other hand a rather neo-classical conciseness, it is not so much a question of proof, which helps little as does the actual temperature on a day like today. A statistical analysis of harmonic and melodic sequences would lead you into a no-man's land of correlations or the lack, which is to say that "feel" and "actuality" may be two different things, and the discrepancy between the two makes for originality, or it does in part. To map out the actual grammatic sequence of a great poem is not necessarily any guarantee of the poem's deep structure and meaning. Thankfully my job here is not to supply the reader with endless tables of sequence, for in the end we listeners go more with "feel" than anything else, and that nebulous territory beyond actuality is what in part gives us pleasure and makes listening a very personal thing, doesn't it? All that explains something of why I find Arthur Lourie's solo piano music in the hands of Moritz Ernst a thing of beauty. The comprehensive 3-CD set takes us from 1908 and his Debussy-Scriabin period through to a more modernist parallel-Messiaenic phase and finally to a crisp neo-classicism and a further beyond by 1938. The set ends with a somewhat extended work for piano and narrator (Oskar Ansull) ("Death's Mistake"), which is the more interesting if you know German well, less so otherwise. In the end Lourie's love for, and immersion in the sensuous properties of the solo pianoforte mark him as a composer of merit and a deeply pianistic poeticism. His stylistically varying output may have made him difficult to pigeonhole during his lifetime, but we can listen today with no expectations and experience the music as a set of wonderful surprises. So for the piano lover out there, here is one you will linger on and continue to uncover joyously unexpected "feels" that run deep. Very recommended for all that. The emergence of Mieczyslaw Weinberg's music since his death in 1996 has been one of the remarkable events of our time. All-but-forgotten at the end of his life, his Polish-Jewish origins, migration to Russia when the Nazis invaded his homeland, his friendship with Shostakovich, who was an unflagging champion of his music, trouble with Stalin and the social realism music police until Stalin's death, his rehabilitation and greatest period from that point forward, all are the stuff of myth yet at times had to have been as harrowingly real for him as a living nightmare. He continued to compose fruitfully no matter what he faced. And now today we have another significant release, featuring the powerful, bitter turbulence of the first of a trilogy of WWII symphonies, Symphony No. 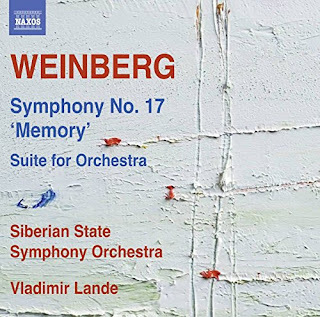 17, "Memory" (Naxos 8.573565), a work that in its power, drama and scope fits in well with Shostakovich's 7th and Prokofiev's 5th as the definitive Russian war symphonies. Weinberg's full subtitle to the work was "In memory of the fallen in the Great Patriotic War." In spite of ultimate victory the Russian death toll was among the highest of the allies, and the music reflects what many no doubt felt, a terrific sense of loss. Vladimir Lande and the Siberian Symphony Orchestra give us an impassioned reading, haunting in its great depth, meditative introspection and labyrinthine expression. The sonics are excellent and the performance never flags. As a bonus we get an early '50s work written during a time when his life was in danger, principally for his Jewishness. The "Orchestral Suite" no doubt was written in an attempt to satisfy the precepts of social realism. Yet the first three movements have a modern and at times Jewish harmonic-melodic core behind the "lighthearted" veneer that no doubt might not have pleased the censors. This recording is a first, and it is suspected too that it is the very first performance. It is by no means a landmark work yet it is fascinating and contrasts with the symphony dramatically. 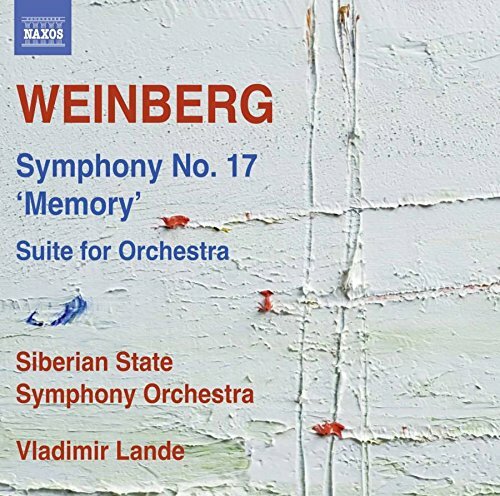 All-in-all this is a valuable addition to the Weinberg discography, mostly for the vibrant reading of the 17th. It might not be my first choice for an introduction to the composer (see the index box for other releases I have reviewed here), but it will no doubt be welcomed by enthusiasts like myself. Recommended. "Let America be America again," wrote Langston Hughes in 1938. It was an America in Depression, facing war, an America where the color of your skin, your religion, your class or your ethnicity set you apart as an "undesirable," yet an America where all dreamed of better. We've come a ways since that time. Now some of us seek to "make America great again," yet what that means divides us, in that there is in one camp a kind of pre-FDR or at least a pre-present vision of a time when there truly was despair, just as perhaps there is now, where some prospered while others went without. Do we really want that again? Or do we want that to continue? All will say no, but how, then? Where, then are we headed? What will power do for the powerless? Pianist Lara Downes pays tribute to the Hughes vision and Martin Luther King's Dream in a volume of beautiful Americana on America Again (Sono Luminus 92207). It is a music of hope and despair born of those terrible years and perhaps a bit before, folk songs like "Shenandoah," classical modern works that have the earthiness of outdoor and everyday America by Morton Gould, Aaron Copland, Roy Harris and select others, and choice Jazz-Afro-American classics by Duke Ellington ("Melancholia"), Scott Joplin ("Gladiolus Rag"), or the hybrid of Jazz-Popular, like Nina Simone's arrangement of George Gershwin's "I Loves You Porgy," and Art Tatum's arrangement of Irving Berlin's "Blue Skies." We find in all this music a world surely not "great" for those who were its victims. Yet the music is touching, beautiful, transcendent. So rhis is an album with a program, in the literal sense. It is music with a message of hope, music written when that was most needed. It celebrates an America where many concerned themselves with articulating the so-called American Dream, and at the same time set about devising means to make it so. The music goes beyond all that to express its own value, AS MUSIC. Lara Downes does a marvelous job making of this music a pianistic triumph. To her we must tip our collective hats in appreciation. For the music wears wonderfully well in her hands. Bravo! Henri Dutilleux departed from this earth in 2013 at the considerable age of 97. He left behind a body of works that marks him as one of France's most original and lucid modern composers, a singular voice of our times. Ludovic Morlot and the Seattle Symphony have done us a great service in recording some of his finest Orchestral Works in a three-CD set (Seattle Symphony Media 1013) that gives us beautifully definitive versions of some ten works spanning his entire career. We are treated in this set to the "Symphonies Nos. 1 & 2," "Tout un monde lontain," "The Shadows of Time," "Metaboles," "Violin Concerto, L'arbre des songes," "Sur le meme accord," "Les citations," "Mystere de l'instant" and "Timbres, espace, movement." Each work carefully and vividly sets up and develops its own sound color landscape that is informed by modernist influences through Messiaen but makes of it all something utterly idiomatic, original, personal. 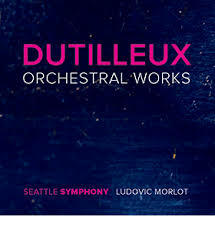 Morlot and the Seattle Symphony in each case enter into the essence of the work and recreate the brilliance lurking within Dutilleux's masterful orchestrations. In the end we experience a retrospective that methodically builds a case for Dutilleux's importance far beyond what any single work could do. The results are remarkable and stunning. No one with an interest in mature modernism and French sound color can afford to miss this set. Ravishing! There is always something new under the sun when it comes to modern classical music. 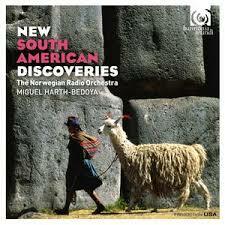 Today, we contemplate something new and extraordinary in New South American Discoveries (Harmonia Mundi 907670), as performed with zeal and spirit by the Norwegian Radio Orchestra under Miguel Harth-Bedoya. On it we are treated to eight characteristic symphonic works by as many living South American composers, who are generally as concerned with local musical elements (though not always in a central thematic role) as they are with a modern outlook. So we find ourselves immersed happily in the music of Victor Agudelo (Colombia), Sebastian Vergara (Chile), Diego Luzuriaga (Ecuador), Diego Vega (Colombia), Sebastian Errazuriz (Chile), Augustin Fernandez (Bolivia), Jorge Villavicencio Grossman (Peru) and Antonio Gervasoni (Peru). The time passes quickly as each work reveals itself in lively fashion in the hands of Miguel Harth-Bedoya and the Norwegian Orchestra. This is music that does not hearken back so much as look forward in dramatic and at times exciting ways. There is nothing but good music to be had. All eight works show us a South America as vitally new as it is delightful. 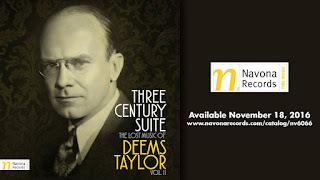 Who was Deems Taylor? He first gained fame as a composer, but was well known as a critic and the radio voice of the New York Philharmonic beginning in the 1930s. He was the first American to be commissioned by the Metropolitan opera for his work The King's Henchman, which along with his second opera Peter Ibbetson enjoyed some success there. His music has fallen so far out of favor that he is virtually unknown today. Until now. 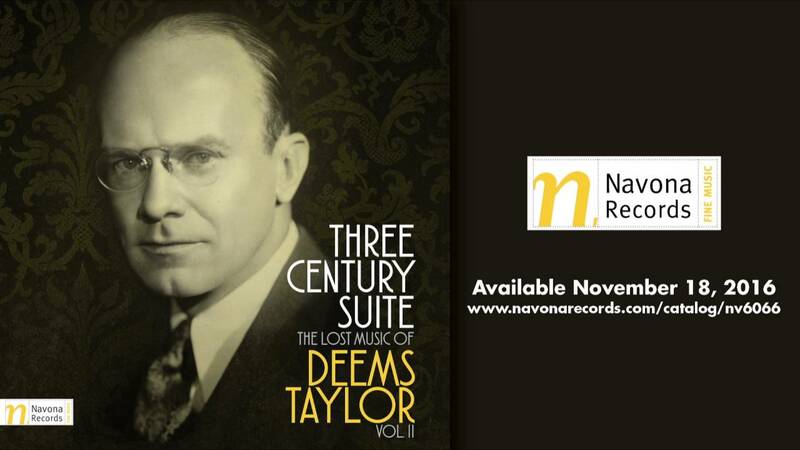 Navona is revisiting some of his music in the series The Lost Music of Deems Taylor, which notches a Volume 2 with the EP Three Century Suite (Navona 6066). The work at hand is very tuneful, lighthearted, but as full as a Victorian overstuffed couch, almost sounding like it was written by an American Edward Elgar. The five short movements have a somewhat rustic charm far from the modernism of an Ives or even a Copland. But indeed this is well written fare, even if it may not blow our 2016 socks off. It is played nicely by the Moravian Philharmonic under Petr Vronsky. Will we see a major Deems Taylor revival? Based on this, probably not. Yet the music stays in the mind and perhaps characterizes something of mainstream US currents we have long left behind. It is nice, if perhaps not especially profound. While Russia was busy producing its distinctive tonal modernists in Stravinky, Prokofiev, Shostakovitch, etc., Poland had its Bacewicz, Symanowski, Panufnik, and shared with Russia the honor of producing Weinberg. Anyone who knows less of the Polish contributions to the art (or for that matter is simply looking for good 20th century music) should listen to Polish Violin Concertos (Naxos 8.573496), an excellent presentation of four works with Piotr Plawner skillfully doing the violin solo honors and the Kammersymphonie Berlin under Jurgen Bruns providing the lively backdrop. These are very memorable works from the hands and minds of Grazyna Bacewicz ("Violin Concerto No. 1" 1937), Alexandre Tansman ("Cinq pieces pour violon et petit orchestre" 1930), Michal Spisak ("Andante and Allegro for Violin and String Orchestra" 1954) and Andrzej Panufnik ("Violin Concerto" 1971). The balance of solo violin expressions and orchestral utterances of distinction is nearly perfect thanks to the near ideal performances and the highly developed thematic developments of the composers involved. You may not know some or even any of these names, but after hearing this recording several times you will appreciate each and every one of them for the quality and liveliness of the music. There is much to recommend this volume, and nothing to regret. Stuff your stocking with this one! 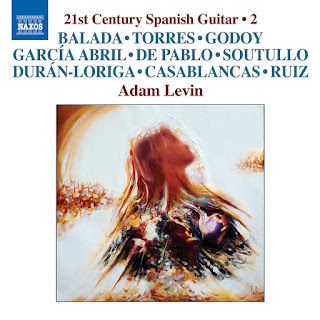 Adam Levin, 21st Century Spanish Guitar 2, Balada, Torres, etc. Spanish guitar technique has evolved over the centuries such that there is now a cohesive body of ways of attacking and/or simultaneously sounding one or more of the nylon strings. In our century those techniques continue to expand in breadth at the same time as the compositions reflect the vast development of melodic-harmonic possibilities present in the overall classical music oeuvre. There seems in fact to be a reflowering of the music today, a most welcome development. We can hear nine examples in 21st Century Spanish Guitar 2 (Naxos 8.573409) played exceptionally well by guitarist Adam Levin as the second volume of a projected four in all. Eight of the nine are in first recordings. All were composed in the present decade. Leonardo Balada's "Caprichos No.11" a reworking of five of Granados' "Danzas espanolas," opens the program with a flair. From there we are treated to interesting and worthy pieces by known and less-known Spanish composers Jesus Torres, Marc Lopez Godoy, Anton Garcia Abril, Luis de Pablo, Eduardo Soutullo, Jacobo Duran-Loriga, Benet Casablancas and Juan Manuel Ruiz. These are compelling modern abstractions with traditional folk and improvisational feels mixed in with bold dashes of the contemporary. All but one were written especially for Levin and are dedicated to him. He returns the favor with dedicated, intricately realized performances that do full justice to the music. This is indispensable listening for anyone interested in modernity in general and the Spanish guitar in particular. Volume two alone is a landmark collection in itself. Do not miss this one! The cold months of the year and especially the holiday season seem like a good time for brass music. That may be personal, as I grew up with Gabrieli and Handel's "The Trumpet Shall Sound" as part of my high school music program in Decembers and I kept up with it later on. 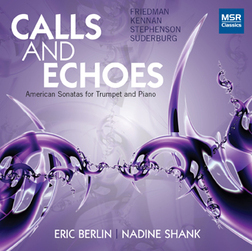 So an album by Eric Berlin, "American Sonatas for Trumpet and Piano," aka Calls and Echoes (MSR 1395) is sounding very good to me just about now. Berlin is a fine virtuoso well matched for the four dynamic and stirring works included on disk. His piano counterpart, Nadine Shank, seconds him with idiomatic and dramatic readings, and so the two render the music quite nicely indeed. These four sonatas come to us in a modern neo-classical style. Each of them ventures meaningfully into the bravura and exploratory pathways that the trumpet-piano pairing suggests. James Stephenson's "Sonata for Trumpet and Piano" (2001), Stanley Friedman's "Sonata for Trumpet and Piano" (1995), Kent Kennan's "Sonata for Trumpet and Piano" (1956) and finally Robert Suderberg's "Chamber Music VII: Ceremonies for Trumpet and Piano" (1984) are works of substance and one might say heroic qualities. By that I mean they demand a sort of heroic ability on the part of the soloist which Eric Berlin brings to us in all fullness. This may have come out several years ago but it is every bit as vibrant now as then. Anyone who loves the trumpet played well and the neo-classical modern idiom will be very pleased with this one, I would certainly say. There is something timeless about the works and performances, yet they blow some warmth into your musical soul that is quite fitting for the winter months! If you had to put a very short list of composers responsible for the French modern school in chronological order it might appropriately read Franck-D'Indy-Debussy-Ravel-Messiaen. Some might have trouble with the fact that Faure, Milhaud, and Poulenc were missing, or Boulez, or any number of others, but the main idea is that Vincent D'Indy (1851-1931) was as important to the modern French School's post-late-romantic beginnings as anyone, yet his music does not bask in the sunlight of continual performances and recordings around the world. But, no fear. 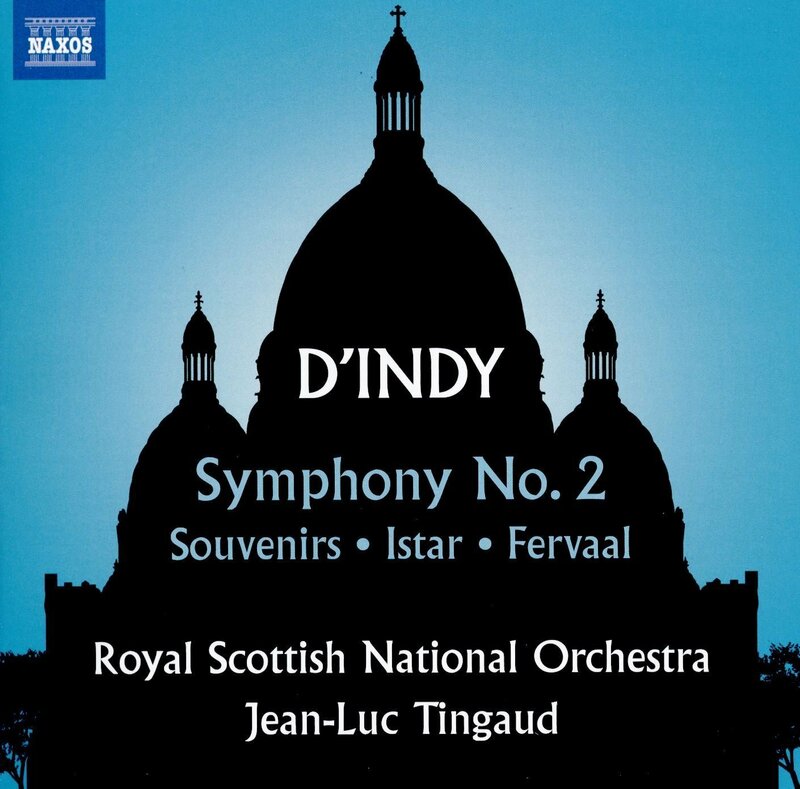 Naxos has released a representative assortment of D'Indy orchestral works headed by his Symphony No. 2 (8.573522). Jean-Luc Tingaud conducts the Royal National Orchestra in a set of dynamic, very serviceable readings that bring out the orchestrational excellence of the works and provide a clear roadmap through the thickets and twists of D'Indy's mature musical mind. The Symphony (1902-03) at first might not strike one as revolutionary in its orchestral language, but close listening brings out the contrasts between folkish themes and proto-impressionist, dappled pictorial orchestration. 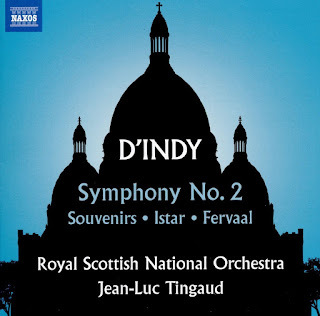 For that matter Wagner's forest music from "Siegfried" was as much pre-impressionist as this D'Indy music could be, but then D'Indy established a French precedent that those that came after could identify as a possible national-modernist trait. What matters now is that his music as heard in the Symphony, his melancholy "Souvenirs" (1906), the somewhat exotic "Istar" (1896), and the Prelude to his opera "Fervaal" (1889-95) offers us a snapshot in time of what was progressive music. If we listen with open ears, we can hear something of what came after but also appreciate D'Indy as fully integral, a fully convincing musical personality in his own right. So this is a nice volume to hear and listen closely to, well done and filled with D'Indy's special music. Give it a hearing! The 20th Century was a high-water mark for classical music, with the recorded medium greatly expanding our ability to hear a great number of works by composers we might otherwise never have had a chance to experience. That situation continues in our present-day world. And we continue to uncover composers and works that have generally been unavailable to us previously. Today we have an example in the music of Sergei Bortkiewicz (1877-1952), whose piano pieces are nicely represented in Russian Piano Music, Vol. 12 (Divine Art 25142). Alfonso Soldano authoritatively mans the piano chair for a full program of solo works that cover the period of 1908 to 1946. 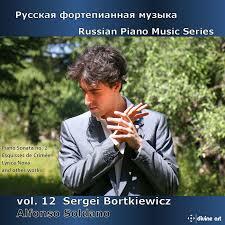 Bortkiewicz was born in the Ukraine, trained for a musical career in St. Petersburg and Leipzig, settled in Berlin. During WWI he was deported and lived again in Russia. The Revolution and WWII found him again fleeing his various homes until the end of the war allowed him to settle one last time in Vienna, where he lived until his death in 1952. Perhaps these continued dislocations can explain why his music has been all-but-forgotten today. That and a rather stubborn will to remain within a late romantic style. Today we care less that someone did not follow the trends and fashions of his or her times, and the music sounds surprisingly fresh, somewhere between Rachmaninov and early Scriabin, yet continuously original in its thematic-melodic creativity. So the end result sounds not so much derivative as an integral voice, another pianistic force within the style-set. Soldano makes a convincing case for these works, with virtuoso dramatics, sparkle, shimmer and dash. I find in Bortkeiwicz as presented here a real discovery, not in some history-changing sense but in the quality and originality of the music. Bravo!